Skutt Kilns was founded over 60 years ago by the father-and-son team of Ralph and Neil Skutt in beautiful Olympia, Washington. They created the ceramic industry’s very first multi-sided hobby kiln, which featured a new and revolutionary lightweight design. This enabled artists to bring kilns into their homes, and cemented Skutt as an innovative leader in the field. Over the years, Skutt has moved from producing manual kilns featuring kiln sitters to kilns that support high-tech digital controllers, allowing you to have incredibly tight control over every aspect of your firings. Skutt’s commitment to quality hasn’t ever changed, though, and the company is well-known throughout the ceramics world as a manufacturer of very high-quality products. Skutt also sets a precedent for great customer services and resources – check out their helpful YouTube videos for great tips about using and caring for your kiln! Skutt has a great philosophy – every object that is placed in one of their kilns has value, whether it’s a child’s art project or a high-end commissioned sculpture. Skutt knows that no matter what the case is, their kilns need to do their job. Skutt offers an incredibly wide range of kilns – if you are interested in purchasing a Skutt kiln but have some questions, our knowledgeable staff is happy to help you! Please give us a call and we will help you to find the right kiln for your home, studio, or classroom. After more than two years of testing and perfecting, Skutt is now offering their new state-of-the-art Touchscreen controller! Available as an upgrade to a new kiln, it is truly the future of kiln firing! 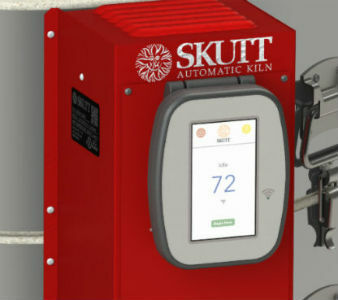 All of the great features you know and love from Skutt controllers are still here, as well as Wi-Fi capability, the ability to monitor the kiln from your phone, storing customized programs to easily return to later, streamlined diagnostics, and so much more. Check out the Upgrades and Add Ons page for full details! Check out our Kilns 101 FAQ!